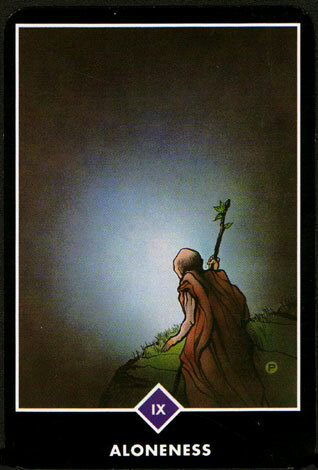 Today's Draw: Aloneness from the Osho Zen Tarot. When was the last time you took stock of who you are and who you've become? Is it possible some of the things you believe about yourself are no longer true? Are you the only architect of your life or has it been shaped by pretty much everyone who's ever had an opinion about you? For today's draw, and possibly for the entire week, I want to focus on the whole "false limitations" thing we discussed yesterday. Briefly, that was about having notions from the time of childhood that certain realities were not meant for us. We might not even realize that some of these ideas have taken hold...we just pushed certain possibilities aside and never thought of them again. The relevance of today's card is that, at some point in our lives, we have to see ourselves from our own frame of reference. You're probably thinking you do that now. And maybe you do. I'm guessing all of us have some sort of self belief that came from someone else, though. Maybe someone described you as gangly when you were young and your self image, weight, exercise routine, choice of clothing, etc., on one level or another, has all been affected by that belief. Being self referenced is shedding all of that and assessing what YOU think of all that. It's not as easy as it sounds, because how do you shed the echoes of 40 years? Of course, body image is just one of those things. What we talked about yesterday are the things that do or don't limit you from goals in your life. Unless you learned to believe differently, if you were told men didn't like gangly girls, you either fixed your gangliness or believed that romance would always be limited in your life. So maybe you settled for less than you deserved, were too shy to approach the men you were interested in or just focused your energies elsewhere. Over time, it stopped being about being gangly and just became your lot in life. Because you believed it, you created it. So today's card is about going inward and really examining what's true about yourself...what you're good at, what you want, what you're capable of, what's not in the cards for you, etc....from YOUR point of reference. From what you know about yourself. And this process isn't just a one-time thing, either. What you wanted and believed about yourself at 30 is different than at 40. Our interests change. And even our capabilities change. You may not suddenly become a math whiz, for example, but you may have developed a deeper focus that helps you concentrate on math problems better. And maybe now the person who shouldn't be let near a tax return might be a good person for the job. So Aloneness not only reinforces the idea of self-reference, but also of the journey of going within and determining who we are today, rather than just plodding along mindlessly, living a life that someone else helped you define. Of course there will always be influences that color who you are. Your parents, chief among them. But the distinction I'm making is between choosing to adopt those things because they make sense to you and just accepting them as what is. Ultimately only one person knows what's best for you and can deliver the contentment you seek. We've spent a lifetime listening to the opinions of others, trying other people's routes, suggesting routes for others and looking over the fence for new ideas. Today's card comes to remind us that the signposts we seek all lie within.